Fiskars Splitting Axe Review - Best Axe For Splitting Wood? This Fiskars splitting axe review is designed to give you a detailed, honest review of a tool I love to use. In order to get the most out of your firewood, it should be split. Splitting your firewood not only makes it easier to handle, but it allows it to season quicker, allowing the air to penetrate all sides of the wood. But what's the easiest way to split the firewood? I own a hydraulic log splitter, a maul and the Fiskars splitting axe. In my opinion, the heavy maul is a thing of the past. Swinging 8-10 pounds all day is exhausting. So I decided to buy the highly recommended X27 splitting axe. What a great investment. The axe is lightweight and I can swing it all day without getting exhausted. The splitting power of the lightweight axe is amazing. The product claims one strike splits and this is no exaggeration. I would say the majority of the swings with this axe split the wood with one strike. No more pounding away, trying to hit the same spot over and over to get the wood to split. One swing and the wood just explodes apart. Of course some logs will require an extra swing or two, but a vast majority only take one. "Unlike traditional axes that can be heavy, quick to dull and easy to break, X-Series Axs combine perfected weight distribution, advanced blade geometry, an ultra-sharp edge and virtually unbreakable design to maximize your performance." Inseparable PermaHead Design - No more worrying about the axe head coming off the handle. Easy-open Carry and Hang Sheath - Protect your investment with the included sheath. The blade on this axe is extremely sharp. The head is constructed of a soft material that will easily dull or chip if you swing it into the dirt. To prevent this, place your wood on a block or other similar surface. By splitting on a block it not only protects the blade from going into the dirt, but it's also safer. No matter what you do, over time through general use the blade will become dull. 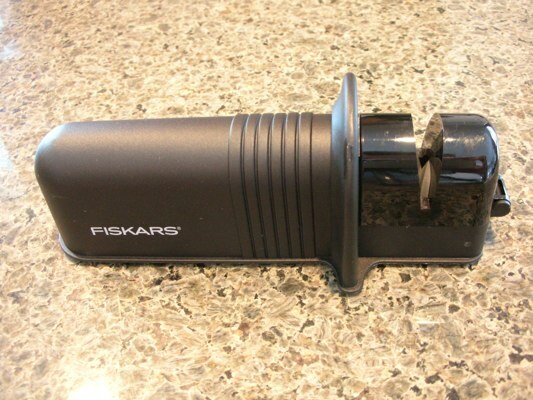 Fiskars offers an optional Axe and Knife sharpener for a relatively low cost. Just a few passes through this sharpener will give you a clean, sharp, factory edge. 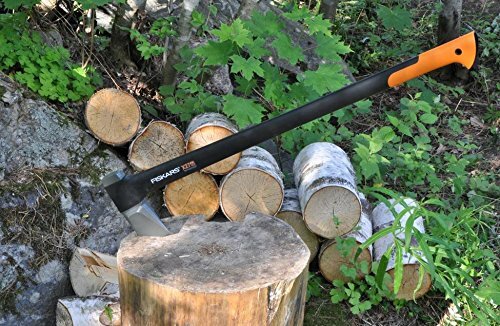 This Fiskars splitting axe review is just like many others you will read. In fact, I think it would be tough to find a negative review about this product. This axe works so well I have not even fired up my hydraulic wood splitter this year. I just grab my axe and go to work. If you're looking for an affordable product that performs well, you will not be disappointed in this axe. Have a review you would like to share? Have you tried a product you feel makes the processing or use of firewood easer, cheaper or more enjoyable? Share it! Your story will appear on a Web page at firewood-for-life.com. You can wrap a word in square brackets to make it appear bold. For example [my story] would show as my story on the Web page containing your story.